Description: A pair of highnose GP38-2s head west with a short freight. Description: I showed up just about 5 minutes before I got this shot! I also got some roster shots of this duo of which I will post soon. Description: Approaching Elkton from the south. Description: NS 6308 goes for a spin on the turntable. Description: Locomotives sitting outside the Juniata Shops. Description: P61 sits @ Five Row stalled out beside the Buck Lead due to the NS 5058 blowing a head gashet and shutting down. The 5058 was just freshly released from Altoona after getting it's cab reinforced and a fresh cut of paint. 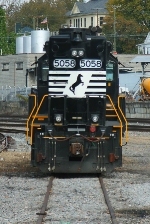 The trailing unit was SD40-2 #6156. Description: TFM and KCS power mingles with "the regulars" in the form of three NS units from the V40. Description: NS V40 passing the CPL at Glade Spring as they head west back to Bristol. Description: NS V40 shoves into Bristol with the two units shoving on the rear and the conductor riding the first hopper. Description: sits with another former Southern soldier in a brief pocket on sunlight with dark, foreboding skies in the distance. Description: NS 94V bringing a few camp cars to Bluefield.